What does the online customer journey look like for tech companies? In addition to focusing on the more traditional parts of the online journey such as pinpointing Moments of Truth (MoTs) in the orientation and purchasing phases, a great deal of attention must also be placed on the user experience side, as this phase can potentially make or break the journey. This applies to both software (such as mobile apps, Software as a Service – SaaS) and hardware products (such as consumer electronics, medical devices, and biotechnology). So why is user experience so important for tech companies? Well, if we look at more traditional online customer journeys such as those of a travel or insurance company, we see that the products they sell are often much less complex to use. Customers in these industries put all of their attention towards the booking process itself or choosing the right insurance package as they already know how to use the product they are buying. However, for the tech industry, purchasing is only just the beginning as these customers must also learn and understand how the product they’ve purchased works. This includes tech giants such as Adobe Creative Cloud, FitBit and LinkedIn, as well as smaller technologies such as Olark, Slack, Product Hunt etc. The key to achieving a good understanding of your customers and being able to better cater to them while simultaneously improving your product is to acknowledge and understand their online journey – especially once they’ve chosen your brand/product. For example, how easy is it to use and/or implement your product? Where are they running into trouble? Or why have they stopped using/buying your product(s). In this blog, we will examine the online customer journey within the technology industry – touching on key factors such as customer personas, the steps of the online journey and how customer feedback can enhance the journey. Every tech company is presented with the same challenge when developing new products and applications and that is how to take their technological expertise and align it with the (latest) needs of their customers. Through the use of customer personas, this becomes much easier for them. They can target users with personalised offers and advertisements to increase awareness of product updates, new developments, etc. Collecting these profiles can also help marketers understand how a particular profile experiences the product and the online journey. Similar to that of the ecommerce industry, the online customer journey for tech companies starts off with the initial decision-making phases, including Awareness, Consideration, Preference and Purchase. While these are all very important phases, what really sets this industry apart from others is what happens after the purchase in the Onboarding and Post-Purchase phases. This is where customers realise that they have a pain point or problem and start to engage in the process of discovering which solutions are out there, which is when the aforementioned customer personas come in handy. After all, you cannot help them if they don’t know who you are. For example, you can connect with these customers using advertisements and campaigns that are targeted to them. Once the customer has familiarised himself with your brand and is aware of the products and/or services offered, the research (or consideration) phase will commence. This includes pricing comparison, product descriptions, product reviews, how soon they can receive the product, etc. Based on their research, your online visitors will ultimately establish a preference as to which company they will purchase from. This is your chance to provide this customer with extra value. And being that it is such a competitive industry, you will want to focus on the concerns he/she has in regards to your product and the purchasing process – a task which can be done using customer feedback. In this stage, you can use customer feedback to gauge if and what kinds of problems your customers are running into on your website. For example, a product video isn’t working, there is an error when the user tries to add the item to their shopping cart, etc. Now is when the customer has finally decided to purchase online! They have selected your product and click through to the checkout page. Two things are critical at this point. You must provide a smooth and flawless checkout process, followed by confirmation of purchase. Note: Should your visitor, for whatever reason, choose not to complete their purchase once they’ve arrived at the checkout page, a good way of understanding this behaviour is exit feedback. You can read more about exit feedback here. 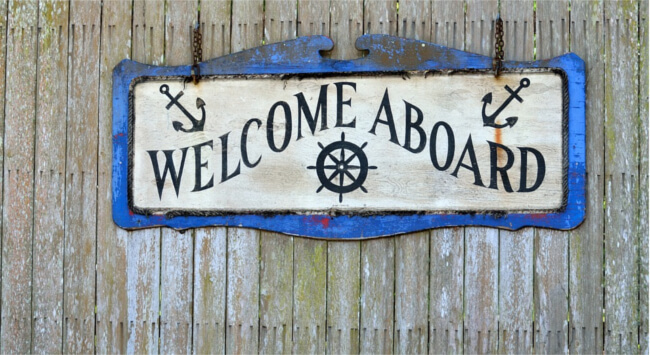 Onboarding is the process in which your customer gets better acquainted with the product they’ve signed up for or purchased from you. If your customer experiences a poor onboarding process (whether they are confused, overwhelmed or can’t find what they’re looking for), it can be detrimental to your growth. In other words, it sets the tone for any future purchases or interactions with your brand. It is also the period in which your business is likely to receive the most feedback and support questions from your customers as they want to get started using the product. Here are some examples from the perspective of SaaS companies. While the materials listed above can be helpful during the onboarding process, there is also another method of ensuring things go smoothly for your customers and that is online feedback. There are various ways to collect feedback during onboarding to optimise the user experience and customer journey for your customers – all depending on the type of product/service you offer and how far along your customer is in the process, of course. Collecting feedback on product or landing page (for software and web-based technologies): Let’s say your visitor is viewing the product page or the landing page. You can place a passive feedback form on this page giving the visitor to option to provide any feedback regarding the product. Passive feedback forms are user-initiated forms visible on websites and mobile apps in the form of a tab or icon located on the side of the webpage. By clicking on this tab, a feedback form will appear asking the visitor to provide their feedback. It is essentially a more passive manner of asking for feedback. Alternatively, if they arrive at this page and try to click away, you can also trigger exit feedback, in which case a form will appear asking them why they are leaving. Activity-based feedback: A lot of companies have a step-by-step onboarding process whereby the visitor must fill in their information to sign up for the service or complete a task that shows that they are successfully using the product. For example, from our own experience at Mopinion, we consider an onboarding successful when a user has deployed their first feedback form and starts receiving feedback from their website or mobile app. Alternatively for a company that sells smart- and sport watches, the definition of successful onboarding might be installing the mobile app associated with the watch and syncing it with your device. And for social media companies like LinkedIn, this could be the action of adding the first connection to your network. As you can see, onboarding processes vary from product to product. So what should you do when this process is not successful and how can feedback help? If you have a web-based service, you can use different types of feedback form triggers based on visitor behaviour, such as, time on the page, exit intent or mouse movement. Alternatively, if you use CRM data (or customer profiles), you can send feedback surveys out via email to gauge, for example, why they haven’t completed all of the steps. Using these insights will enable you to identify any hurdles your customers are experiencing throughout the onboarding process as well as help them reach completion and start using your product. In the technology world when it comes to developmental improvements, an iterative approach is often needed. What we mean with this is that if you want to be able to make constant improvements to your product, feedback surveys should be sent out in cycles that quickly give you insight regarding the user experience of your product(s) – these are referred to as short feedback loops. According to the Lean Start-Up methodology, applying short feedback cycles before building a product (a development technique known as minimum viable product) are the key to creating a truly successful product. These cycles enable you to constantly test out new models of products by getting feedback from customers (or other parties, such as purchasers and partners) and using that feedback to make further improvements and enhance the product. As you might’ve guessed, the journey doesn’t end with a successful onboarding. After the customer has been onboarded, you’ll want them to continue using your product as well as come back for more. To ensure that this happens, it’s important to keep in touch, whether that’s by sending regular product updates and announcements, checking up on them to see if the product they purchased is still to their liking, etc. That is precisely why the use of feedback in this stage is equally as important as with onboarding. An example of this might be first week evaluations (in other words, a follow up): you can do this using a survey invite via email to see how they like the product or service thus far. Alternatively, if it is a web-based service, you can set up a feedback form with the same feedback contents. As you can see, in the tech industry, customer feedback is a critical component that can be applied in various ways across the online customer journey. It enables online marketers to optimise the journey for customers who experience issues in a wide range of activities including purchasing, onboarding and even in the post-purchase phase. What’s more is your business can also benefit from collecting this customer feedback in the sense that user experience issues can be quickly identified and taken into account for future product and service optimisation.